In all honesty, I always thought the “Windows Key” on my keyboard was just a nuisance. It was just the thing I accidentally hit once in a while and the darn Start menu would pop up. Turns out I was wrong, it has a lot of uses. Windows Key + Tab: Cycle through the buttons in the Task Bar. Windows Key + M: Minimizes all open windows. Of course, the windows key is pretty useless if you don’t use windows. Go figure. Chris: Not entirely true — on other, more “enlightened” platforms you can just map the windows key to “Meta” (most US keyboards don’t have Meta … just Alt, Shift, and Control) and use it as another, well meta-key :) Most window managers will permit using it as a modifier on shortcut keys. Can be handy. Windows-Ctrl-Tab isn’t a key combo. Ctrl-Tab will cycle your Firefox tabs without the windows button. You can cycle through the items of the taskbar by opening the Start menu by pressing the Windows Key, hitting ESC to close it but keep it selected, and hop through the lot pressing TAB. The cycle goes left to right, ending with the desktop. Windows Key + Ctrl + Tab does not have any more functionality than simply pressing Ctrl + Tab, like Dustin wrote. I’ve been using these keys ever since Windows XP, especially for the explorer, desktop, run dialog and system properties. if you are in a firefox window with multiple tabs, windows-ctrl-tab will cycle thru the tabs. You can’t do that with just ctrl-tab. hitting F3 when windows exlorer is open or when you’re looking at the desktop also initiates a search dialog! actually mitch, ctrl-tab cycles through tabs in all my tabbed apps, without the windows key. interesting, i was wondering though, what is the “pause/break” key for. Pressing Ctrl+Tab will switch between tabs (such as tabs in Windows properties windows and those in Firefox, Opera and Internet Explorer 7). The Windows key has NO influence on this key combination. 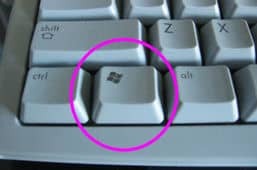 Pressing the Windows key + L is the equivalent of switching users, unless you have set your keyboard up as a Microsoft Natural Keybard, in which case it will log you out. Bear in mind that returning the the login screen does not necessarily mean you are logged out. The Pause/Break key originates from the DOS-era, where you could pause or break an application, for example for debugging purposes. It still works during boot and in the DOS shell. This function no longer works in modern operating systems. Likewise, the scroll lock key only works for a handful of programs (such as Excel and Lotus Notes). “windows + S” to toggle CAPS LOCK? That makes about as much sense as “ctrl + alt + shift + E” to hit “Enter”… I wonder why the key combo when there is already a key reserved for that specific purpose? It doesn’t do anything but pop up an on screen menu that looks like a volume control. But it’s not. It doesn’t work on all W98SE systems. I have no idea what use it has though. Hi man. Thanks to u, I’ll save time when i open up the Run dialog box. I wud just like 2 add a clarification about the functionality of WINDOWS+CTRL+TAB key.. The WINDOWS+CTRL+TAB key works as Microsoft says when all the windows are minimized and you should be viewing the desktop when you try using it. If you try it with any window open, the functionality differs as mentioned by many of our frnds above.. This is incredible. It will really save me time. I’ve forwarded this page’s URL to all my friends. Thanks! Note that Windows + Tab has a different use in Vista/7 with Aero enabled – it activates Flip 3D. Adding Ctrl keeps the windows there until you click one. i have benefited alot from all your contribution. i can now perform some basic settings with my key board without any problem. That was true before Windows 7. In Windows 7, CTRL + Tab does nothing. You must press the windows key as well. I now finally understand why the CTRL + Tab doesn’t work on my new laptop.